You may have seen the above, fairly comical image floating around the Internet recently, but I assure you: It is both more and less humorous than it seems. 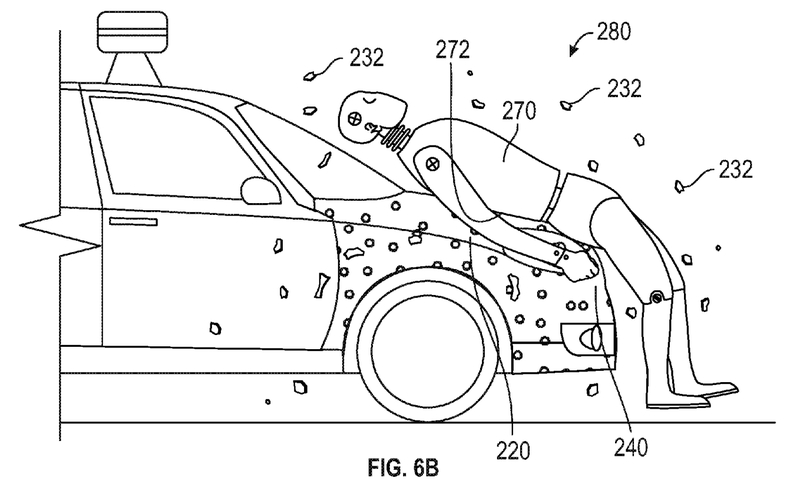 It’s from a Google patent filing for an adhesive front end for Google’s self-driving cars, so not only is that crash test dummy in a silly-looking position, but it’s stuck there like a cartoon. The front region of the vehicle may be coated with a specialized adhesive that adheres to a pedestrian, and thus holds the pedestrian on the vehicle in the unfortunate event that the front of the vehicle comes into contact with the pedestrian. The adhesion of the pedestrian to the vehicle may prevent the pedestrian from bouncing off. There are also concerns raised by the “flypaper,” just like with any other car safety apparatus. If a pedestrian gets stuck to a car, and that car then collides with something else, for instance, that’s much worse than if they had been thrown clear after the initial impact. To be honest, I’m less worried about that than I am about people using it to do their best Spider-Man impression on the hood of a moving vehicle. You can idiot-proof cars all you want, Google, but never underestimate the tools you provide to especially creative idiots.